World Heritage – Travel in Italy 02. The philately of San Marino goes on with the tour through the beauties of Italy with a souvenir sheet made up of 4 values. Each stamp designed by Esploratori dello spazio depicts some cities with a characteristic architecture. The philatelic tour represents the following cities: Verona, Mantua and Sabbioneta, Modena and San Gimignano. An historical and cultural project with contributions from the Associazione Beni Italiani Patrimoni Mondiale Unesco that pays homage to the attractive beauties of Italy. The first stamp represents Verona, registered in the World Heritage List in 2000; it is an extraordinary example of city developed in 2000 years, combining excellent artistic elements of different periods. The value dedicated to Verona shows a work of art by Stefano di Giovanni, Madonna con il bambino e Santa Caterina, called Madonna del Roseto, tempera painting on wood moved to canvas, cm 129x95, inv. 173-1B0359, Verona, Museo di Castelvecchio, photograph by Umberto Tomba. The second stamp depicts two cities which represent two main forms of Renaissance urban concept: a new built city (Sabbioneta), based on the concept of ideal city and the transformation of an already existing city (Mantua). The third value shows the Cathedral of Modena, the Tower and Piazza Grande that became World Heritage in 1997. The last stamp represents San Gimignano with Palazzo Comunale and Torre Grossa. 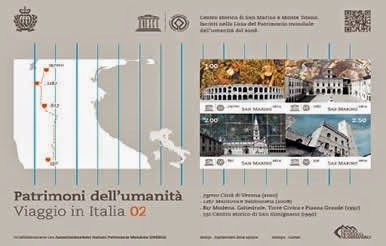 Each value bears the logos of Unesco and of the Associazione Beni Italiani Patrimonio Mondiale Unesco and the identification number of the Unesco site.